KRR ProStream are very pleased to be part of the Achilles UVDB registered suppliers. Being a member of this organisation allows KRR ProStream unparralled access to potential clients and customers. More importantly, it allows potential users of the key services that KRR ProStream provides to find us in the UVDB database. Some companies will only contract with suppliers that are on the Achilles UVDB database, as the registration requires a very comprehensive vetting of the supplier concerned. This ensures that the quality of the service is guaranteed. 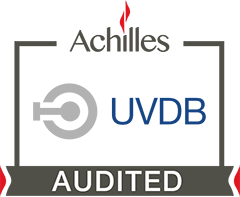 KRR Prostream is proud to be considered a registered member of the Achilles UVDB community and has the attained the B1 Verify audit.